﻿ In terms of climbing the Vosges are roughly half the Alps. The number one in the Vosges of this site, Le Grand Ballon-south-west, counts 674 climb effort points (cep) and 964 meters of ascent compared to 1637 cep and 1497 meters for my number one in the Alps, the Ötztaler Gletscherstrasse. An asset of the Vosges is the high density of climbs. 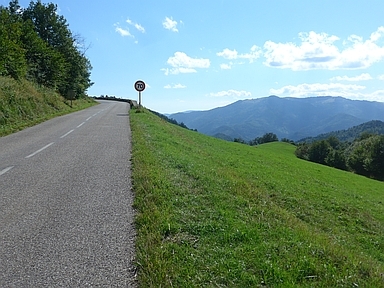 Some summits can be reached from multiple sides, like Le Grand Ballon from 5 and the Ballon d'Alsace from 3 sides. Roads are mostly quiet and well paved. Unfortunately, views are scarce since most areas are densely forested. The exception is the typically more open landscape of the highest parts. A remarkable feature is the scenic and touristic Route des Crêtes, which more or less follows a north-south running crest culminating in some of the highest peaks. Many of the interesting climbs lead up to the Route des Crêtes from valleys to its eastern or western side.